In American and Canadian football, instant replay is a method of reviewing a play using cameras at various angles to determine the accuracy of the initial call of the officials. An instant replay can take place in the event of a close or otherwise controversial call, either at the request of a team's head coach (with limitations) or the officials themselves. There are restrictions on what types of plays can be reviewed. In general, most penalty calls or lack thereof cannot be reviewed, nor can a play that is whistled dead by the officials before the play could come to its rightful end. 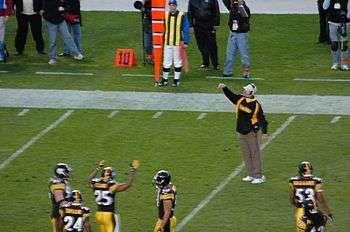 Bill Cowher, then head coach of the Pittsburgh Steelers, throws the red challenge flag (visible in the upper left corner of the picture), indicating his desire to challenge the officials' ruling. The National Football League first adopted a limited Instant Replay system in 1986, though the current system began in 1999, bringing in the opportunity to "challenge" on-field calls of plays. The current system mirrors a system used by the now defunct USFL in 1985. Each coach is allowed two opportunities per game to make a coach's challenge. Before the 2004 NFL season, the instant replay rule was slightly changed to allow a third challenge if both of the original two challenges were successful. A challenge can only be made on certain reviewable calls on plays that begin before the two-minute warning and only when a team has at least one time-out remaining in the half. Up until the 2005 season, coaches could signal a challenge via an electronic pager, now used only by the replay assistant. The coaches now throw a red flag onto the field, indicating the challenge to the referees. This red flag was originally the "backup plan" if the pager were to fail, but it has become the more popular option among NFL coaches to signal a replay request. The referee has 60 seconds to watch the instant replay of the play and decide if the original call was correct. The referee must see "incontrovertible visual evidence" for a call to be overturned. If the challenge fails, the original ruling stands and the challenging team is charged with a timeout. If the challenge overrules the previous call, the call is reversed; should there have been an official score change, the score will be changed again, resulting in the original score and with no loss of a timeout. Because of the limited number of challenges, and the possible penalty of a lost timeout, coaches typically reserve their challenges for key plays. A questionable call may not be challenged once the next play is underway, so coaches may be forced to make a quick decision without the benefit of seeing a replay on television or on the stadium screen. If a questionable call is made in favor of the offense, then the offense will often line up and snap the ball quickly to prevent the opposing coach from challenging the call. Often players on the field will signal to the coach if they believe the play should be challenged. During a scoring play (starting in 2011), turnovers (starting in 2012), or after the two-minute warning of each half, and in overtime, reviews can only take place if the replay assistant, who sits in the press box and monitors the network broadcast of the game, determines that a play needs review; coaches may not challenge during these times. In those cases, the replay assistant will contact the referee by a specialized electronic pager with a vibrating alert. If a review takes place during that time while the clock is running, the clock will stop for the review, and then it will start running once the ball is set and ready for play. Starting with the 2010 season, any reviews with the clock running inside one minute will have a 10-second rundown, which can be voided if either team uses a timeout. One concern about replay that was addressed some years ago was the situation where a coach would seek a review of a non-challengeable call (such as being forced out of bounds, or in some cases to challenge a runner down by contact). Before the rule was clarified, a team would lose the challenge and a time-out. The current rule does not penalize a team in such a case, provided the rule is not abused or taken advantage of. If a play is overturned, the official is also responsible for making any related revisions to the game clock if applicable, especially in late, game-ending situations. For instance, if a player makes a reception and runs a long distance, several seconds may run off the game clock. If the play is challenged and the catch overturned, the game clock would be reset to have stopped at the moment of incompletion (presumably adding time back to the clock). Note that the spot of the ball may be challenged in certain cases. In such cases, a decision to respot the football is not enough to win the challenge; only when the ball is respotted and the ruling on the field is reversed by remeasurement is the challenging team not charged a timeout. Some unusual, and confusing sequences of events can occur during replay stoppages, and most have been addressed through rules clarifications. For instance, if a team commits a delay of game penalty (before the snap), the opposing team still has the opportunity to challenge, provided it is done before the ensuing snap. Also, inside the two-minute warning, if a team calls a timeout in the normal course of play, but the replay assistant calls for a challenge of that play, the initial timeout is ignored and restored in favor of the replay stoppage. The current replay system replaced a previous system used from 1986 through 1991, when a procedure similar to that of college football was used. In 1987 commissioner Pete Rozelle saved the system for another season; in 1988 Pittsburgh Steelers owner Dan Rooney saved it. From before 1986, and from 1992 to 1998, no replay system was used. While there is occasional controversy over the appropriateness of overturned calls, the system is generally accepted as an effective and necessary way to ensure a fair game. Despite the rules that a play cannot be challenged if another play was run, it has happened on at least one occasion under the current rules. In 2001, the Cleveland Browns were driving toward the east end zone of Cleveland Browns Stadium against the Jacksonville Jaguars for what would have been the winning score. A controversial call on fourth down gave the Jaguars the ball. Browns' receiver Quincy Morgan had caught a pass for a first down on 4th and 1. After Tim Couch spiked the ball on the next play, referee Terry McAulay reviewed Morgan's catch, claiming that the replay officials had buzzed him before Couch spiked the ball. Upon reviewing the play, McAulay determined that Morgan never had control of the ball, thus the pass was incomplete, and the Jaguars were awarded the ball via turnover on downs. Fans in the Dawg Pound began throwing plastic beer bottles and other objects on the field, in an incident dubbed "Bottlegate". McAulay declared the game over and sent the teams to the locker rooms. NFL Commissioner Paul Tagliabue then called to override the referee's decision to end the game, sending the players back onto the field, where the Jaguars ran out the last seconds under a hail of debris. The loss would have major playoff implications for the Browns, who dropped to 6-7, although the team would've finished out of the playoffs had they won the game anyway. In 2006, the NCAA Football Rules Committee enacted instant replay guidelines and added them to the football playing rules. For games involving two schools from the same conference, league policy determines whether replay will be used. For non-conference games, the home team makes the determination. There is reasonable evidence to believe an error was made in the initial on-field ruling. Any reversal of the on-field ruling, which can only result from indisputable video evidence, would have a direct, competitive impact on the game. Once per game, each head coach may also call a timeout and challenge the ruling on the previous play before the next play starts. A coach must have at least one timeout remaining in order to challenge (teams receive three timeouts per half). If the challenge is successful and the on-field ruling is overturned, the team keeps its timeout and is allowed only one more challenge. If unsuccessful, the team loses its timeout and is allowed no more challenges. After reviewing the play from available video angles, the Replay Official decides if the call should be upheld or overturned. If the call is overturned, the Replay Official provides the proper information to restart the game, such as the team in possession, the yardline where the ball should be placed, the correct down and distance, and the correct time on the stadium clock. Should there have been an official score change, the score will be changed again, resulting in the original score. College football instant replay was started by the Big Ten Conference in the 2004 season because of what happened in the 2001 Michigan vs. Michigan State football game, when reviews were used experimentally in the Big Ten Conference only. In the 2005 season, all conferences were allowed to use instant replay. Among Division I Football Bowl Subdivision (see Division I-A) conferences, the Atlantic Coast Conference, Big East, Big Ten, Big 12, Conference USA, MAC, Mountain West Conference, Pac-10, and SEC used replay in 2005. The Sun Belt and Western Athletic did not. In 2005, the Big 12 initially sought to provide field monitors which would allow the on-field referee to assist the replay official; however, by the first game of the season, they decided to only provide equipment to the instant replay booth. Conference USA used a similar system, but the on-field referee made the decision after viewing a TV monitor on the sideline. The Mountain West Conference was the only league to allow a head coach's challenge. Each head coach got one challenge per half. If the call was overturned, the challenging coach kept his timeout and got a second challenge for that half. If not, the challenging coach lost one of his three timeouts for the half. No more than two challenges per half per coach were allowed. There is not currently an instant replay equipment standard, each conference must choose (and purchase) its own equipment. Therefore, systems are quite disparate: they can be as complex as the high-tech custom systems similar as those used in the NFL to as simple as several large screens hooked to a digital video recorder using the direct-to-air feed of the broadcasting entity televising the game or a venue's internal coverage unit. 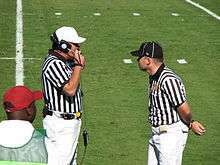 In 2005, the Big Ten, MAC, and SEC only allowed broadcast video (for games that are televised) to be used to determine the correct call. The other conferences allowed broadcast video and scoreboard video. Most conferences provided video equipment for games that were not televised. Instant replay was used in post-season games for the first time in the 2005 season. It was used in all 28 bowl games as well as the Division I Football Championship Subdivision (FCS, née I-AA), Division II and Division III national championship playoff games. CFL teams are initially allowed only two challenges per game. Just like the NFL, a provision was added years later (before the 2009 CFL season) where a team is also awarded "a third instant replay challenge if its first two challenges are successful." This amendment to the rule was a result of CFL Commissioner Mark Cohon asking for fan input on proposed rule changes to be presented to league's board of governors. Prior to 2013, CFL teams were only allowed one time out per half (as opposed to three in the NFL), the first challenge has no effect on time outs whether successful or not. Only if the second challenge is unsuccessful would the time out be charged. Since 2013, CFL teams are given two time outs per half, so the first challenge will now be charged a time-out if the challenge is unsuccessful. Teams cannot challenge in the final three minutes of the second half or in overtime; however, a replay official may initiate a review during these times (as the CFL uses a three-minute warning as opposed to the NFL's two-minute warning). The CFL has a replay official at its head office which conducts the review, rather than using a booth on the sidelines and there is no time limit to make a decision. ↑ "Top 10 Most Ridiculous Sports Fan Moments - Photo 1 of 10 - NESN.com". Media.nesn.com. 2010-11-18. Retrieved 2012-08-09. ↑ "Browns". Cleveland.com. 2014-12-16. Retrieved 2016-09-25.